The bowl season, like the holidays, is upon us. With so many games to choose from we figured that we should save you some time and point you to what should be the best of the best this bowl season. All times are Pacific by the way. New Mexico Bowl: Colorado State vs Washington State – 11am ESPN: This game has a tendency to be close. With two teams excited about being there, this could be as good as last years game. Las Vegas Bowl: Fresno State vs USC – 12:30pm ABC: Fresno State QB Derek Carr could propel himself into the first round of next years NFL Draft with a great showing in this game. USC, a lot of changes coaching wise so we’ll see if they can not lay an egg like they did last year in their bowl game. If they do show up, this could be one of the top 10 games of the bowl season. Poinsettia Bowl: Northern Illinois vs Utah State – 6:30pm ESPN: The last time you can see NIU QB Jordan Lynch and a chance to see a very underrated Utah State team. Fight Hunger Bowl: Washington vs BYU – 6:30pm ESPN: Should be a lot of offense even if UW is a team in the middle of a coaching transition. They still have a veteran QB in Keith Price and an all everything RB in Bishop Sankey. BYU has QB Taysom Hill and he is a beast to bring down. Russell Athletic Bowl: Louisville vs Miami – 3:45pm ESPN: Louisville just missed out on a second straight BCS berth and Miami is in the post season again after a self exile. Game is in Orlando and is big recruiting game for both schools and a preview of an ACC game next year. Music City Bowl: Georgia Tech vs Ole Miss – 12:15pm ESPN: Two teams that are still licking their wounds from tough overtime losses to arch rivals. This could make or break each team going into next season especially Ole Miss. They have a young team and a win here could prove to be a huge stepping stone going into next season. Alamo Bowl: Oregon vs Texas – 3:45pm ESPN: This game is notorious for being awesome. Two years ago, it was the RGIII show as he and Baylor hung 67 on Washington. Last year it was a last second field goal. It’s also Mack Brown’s last game as head coach of Texas. They’ll show up for him and could give a BCS robbed Oregon a run for their money. AdvoCare v100 Bowl: Boston College vs Arizona – 9:30am ESPN: The country’s best RB Andre Williams vs a tough and under appreciated Arizona team. Chik-Fil-A Bowl: Texas A&M vs Duke – 5pm ESPN: It’s probably your last chance to see Johnny Manziel as a collegiate. There is also the possibility of a shootout on New Year’s Eve. Capital One Bowl: South Carolina vs Wisconsin – 10am ABC: Two teams that could be in the BCS if it wasn’t for a tough loss here and there. Should be the game of the morning. Rose Bowl: Michigan State vs Stanford – 2pm ESPN: This is going to be a good ole fashion, hard hitting football game. Should be tough, close and fun to watch. Fiesta Bowl: Baylor vs Central Florida – 5:30pm ESPN: Baylor scores a ton of points and Central Florida has been this seasons “cardiac kids”. 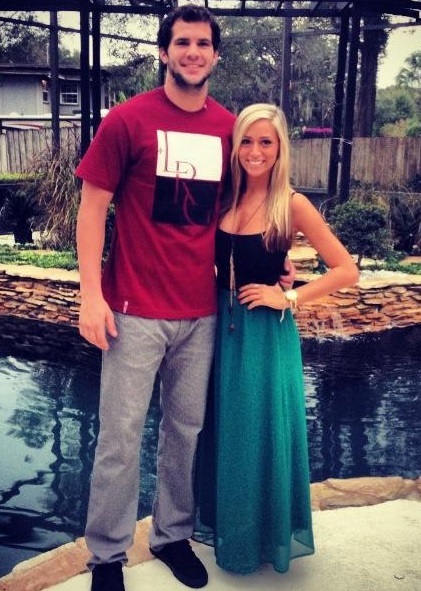 Also, UCF QB Blake Bortels is a possible first round draft pick and has a smoking hot girlfriend. Cotton Bowl: Missouri vs Oklahoma State – 4:30pm FOX: Possible shootout factor here. We’ll see if both teams can recover from heartbreaking season finale losses that kept them out of a major BCS payday. Mizzou still has one of the better front four’s in all of football and is worth checking out. Orange Bowl: Ohio State vs Clemson – 5:30pm ESPN: Two years ago Clemson gave up 70 points in this game to West Virginia. Ohio State may be able to do that to them but Clemson might be able to do it to Ohio State too. BBVA Compass Bowl: Houston vs Vanderbilt – 10am ESPN: Vandy is good and Houston is a team that can give people fits. If Vandy doesn’t come in ready to play it could be a long day in Birmingham for the Commodores. BCS National Title Game: Florida State vs Auburn – 5:30pm ESPN: It’s a great match up. NFL talent all over the field and a new take on an old school triple option. Should certainly be better than the last two national title games.